This morning I appealed the Fifth Circuit Judicial Council’s order dismissing the misconduct case against retired U.S. District Judge Harry Lee Hudspeth of Austin. 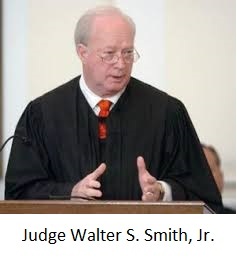 In a letter to an appellate committee of the Judicial Conference of the United States, I also appealed the Fifth Circuit’s latest order concerning the sexual misconduct charges against retired U.S. District Judge Walter S. Smith. I write to appeal the orders of the Judicial Council of the Fifth Circuit in the cases listed above, specifically the September 18, 2016 order concerning Judge Walter S. Smith, Jr. and the October 21, 2016 order concerning Judge Harry Lee Hudspeth. The two cases are related and, as you know, the Committee remanded Case No. 05-15-90120 to the Fifth Circuit once before. The Fifth Circuit has an established reputation for downplaying and covering up the misconduct of its judges, see Skip Hollandsworth, “Perversion of Justice,” Texas Monthly, October 2009 (http://www.texasmonthly.com/articles/perversion-of-justice), and the latest orders appear to be part of that pattern. In both cases, it appears that the investigative process was delayed until the respondent judges could retire, at which point the Fifth Circuit could essentially shrug its shoulders and say, “Aw shucks, there’s nothing more that we can do.” For that reason, I wish to challenge the Fifth Circuit’s interpretation of Rule 20(b)(1)(B) of the Rules for Judicial-Conduct and Judicial-Disability Proceedings. Citing other circuits, the Fifth Circuit seems to suggest that further proceedings are unnecessary per se if a judge retires, further implying that a judicial council or special committee no longer has authority to investigate a retired judge. In reality, nothing in the rules prevents a judicial council from investigating, censuring and/or reprimanding a judge following his or her retirement, and in fact censure or reprimand of a retired judge could still serve as “remedial action to ensure the effective and expeditious administration of the business of the courts…” See Rule 20(b)(1)(D). If judges knew that their misdeeds could ultimately be exposed regardless of how long they had previously escaped justice, that would serve as a rather strong deterrent against the sort of misconduct allegedly perpetrated by Judge Smith or Judge Hudspeth. Furthermore, and as explained below, nothing in the rules prevents a judicial council from making an impeachment referral after a judge has retired. I would direct the Committee’s attention to Rule 20(b)(2). Under the heading “Mandatory actions,” the rule states that a “judicial council must refer a complaint to the Judicial Conference if the council determines that a circuit judge or district judge may have engaged in conduct that: (A) might constitute ground for impeachment; or (B) in the interest of justice, is not amenable to resolution by the judicial council.” Rule 20(b)(2)(emphasis added). As explained in my original complaints against Judge Smith and Judge Hudspeth, each is accused of misconduct that is punishable as a felony under federal law. Not only “might” that “constitute ground for impeachment,” 28 U.S. Code § 355(b)(2) strongly infers that felony crimes should be brought to the attention of the U.S. House of Representatives. And although the Fifth Circuit attaches great importance to its conclusion that Judge Smith had not sexually abused women in “many years,” I should note that there is no limitations period for judicial misconduct. Likewise, it is worth noting that Congress and many state legislatures have eliminated the limitations period for sexually abusive crimes. With respect to Judge Hudspeth, the Fifth Circuit claims that it abated his case while it was investigating the case against Judge Smith. There was, however, no reason for the abatement. The case against Judge Hudspeth was considerably simpler than the case against Judge Smith: either Judge Hudspeth was told about Judge Smith’s alleged misconduct or he was not, and he either took appropriate action or he did not. Yet in its October 21, 2016 order, the Fifth Circuit expressed agnosticism about whether the allegations were true before washing its hands of the matter. For the reasons set forth above, the Fifth Circuit could have and should have completed its investigation and made appropriate findings. Furthermore, the initial investigation of Judge Smith was completed in October of 2015 and the initial order was released on December 4, 2015. 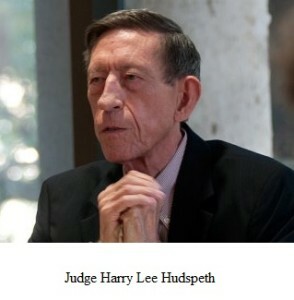 Judge Hudspeth was allowed to retire quietly the following month, creating the appearance that the Fifth Circuit abated his case in order to give him a chance to retire and save face. In the case of Judge Fuller, the Committee implicitly ruled in favor of (1) transparency and (2) the notion that Congress should decide whether impeachment was warranted, not the judiciary. I urge the Committee to make those holdings explicit rather than implicit, for the benefit of both the judiciary and the public at large. Otherwise, the public may reasonably assume that the Fifth Circuit will keep on downplaying judicial misconduct. Additionally, the Fifth Circuit should be directed to forward its investigative files to the Committee so the Committee can reach its own conclusions. The Committee already remanded Case No. 05-15-90120 back to the Fifth Circuit for additional findings, as noted above, yet the Fifth Circuit did not produce most of the additional findings as directed by the Committee. For example, the Committee directed the Fifth Circuit to make further findings about Judge Smith’s attempts to deceive investigators, but the Fifth Circuit shrugged that off with the following sentence: “The first order also indicated that there were misrepresentations by Judge Smith that extended the proceeding, but that did not affect its outcome.” That was the entire response to the Committee’s direction to make further findings, i.e., the Fifth Circuit simply refused to make further findings. In fact, the Fifth Circuit’s September 28, 2016 order is downright deceptive. Consider the following sentence: “As noted in the first Judicial Council order, there is evidence that there were other incidents involving Judge Smith similar to the incident that was the focus of the complaint.” In reality, the first order said absolutely nothing about other incidents, and that is why (1) I appealed the first order and (2) the Committee remanded the case. At every stage, it seems that the Fifth Circuit was more interested in managing appearances than protecting judicial integrity, thus I cannot have confidence in the Fifth Circuit’s handling of the complaints against Judge Smith and Judge Hudspeth. On the contrary, it appears that the Fifth Circuit is still determined to minimize and downplay any misconduct by its judges. Finally, I must address the Fifth Circuit’s conclusion in both cases that impeachment would not affect a judge’s retirement annuity. I am inclined to agree with that conclusion. Nonetheless, the Committee has not previously addressed the question (as far as I can determine), and even if the Committee agrees with the Fifth Circuit, the Committee may wish to flag the issue for Congressional consideration. One can make a strong case that a judge who committed crimes in office should not be drawing a six-figure retirement. Thank you for in advance for your consideration.